The impact of cholesteryl ester transfer protein (CETP) on atherosclerotic development in humans remains unclear. Plasma cholesteryl ester transfer was shown to be associated with carotid intima-media thickness in type 2 diabetic (T2D) patients with adequate metabolic control. Since glycation of CETP may influence cholesteryl ester transfer processes, it is important to determine if plasma cholesteryl ester transfer is still a determinant of carotid intima-media thickness (IMT) in patients with poorly controlled diabetes. The aim of the present study was to determine whether CETP activity influences carotid IMT in T2D patients with poor metabolic control. In 110 individuals with T2D, we measured CETP mass concentration with ELISA, CETP activity with a radioactivity method and carotid intima-media thickness with high-resolution real-time B-mode ultrasonography. The mean HbA1C was 8.8 ± 1.7%. Carotid IMT did not correlate with CETP activity in the total population. 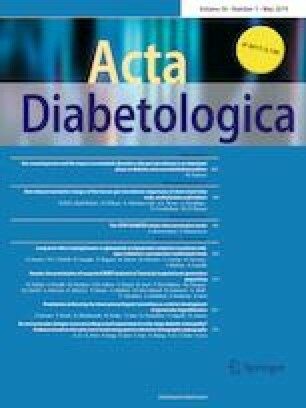 In T2D patients with HbA1C < 8% (n = 33), mean HbA1C was 6.9% and the correlation between carotid IMT and CETP activity was not significant (p = 0.09). In a multivariable analysis that included the total population, carotid intima-media thickness was positively associated with diabetes duration (p = 0.02) but not with CETP activity or HbA1C. We observed no correlation between carotid intima-media thickness, a marker of early atherosclerosis, and CETP activity in T2D patients with poor metabolic control. Disease duration, which reflects accumulated metabolic abnormalities, may have blunted the potential effect of CETP on atherosclerosis. Metabolic control appears essential to determine the pro- or anti-atherogenic influence of CETP in patients with T2D. This work was supported by the Centre Hospitalier Universitaire de Dijon (AOI 2011), and proofreading services were provided by Suzanne Rankin (DRCI). We thank Dr. Serge Aho for his help in complementary statistical analyses. All procedures performed in the study were in accordance with the ethical standards as laid down in the 1964 Declaration of Helsinki and its later amendments or comparable ethical standards. Written informed consent was obtained from all patients before inclusion.